Review • PTC's opener is lively and full of fun. 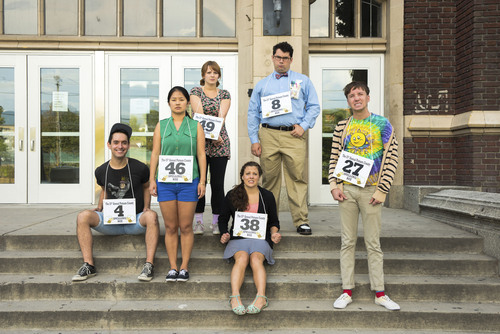 Courtesy photo The cast of Pioneer Theatre Company's "The 25th Annual Putnam County Spelling Bee" on location at West High. Elise Groves (Logainne Schwartzandgrubenierre), Shannon Tyo (Marcy Park), Kendal Sparks (William BarfËe), Austin Archer (Leaf Coneybear), Emily Walton (Olive Ostrovosky) and Jacob Hoffman (Chip Tolentino). Courtesy photo The cast of Pioneer Theatre Company's "The 25thAnnual Putnam County Spelling Bee" on location at West High School. Emily Walton (Olive Ostrovosky), Jacob Hoffman (Chip Tolentino), Shannon Tyo (Marcy Park), Austin Archer (Leaf Coneybear), Elise Groves (Logainne Schwartzandgrubenierre) and Kendal Sparks (William BarfËe). Courtesy photo The cast of Pioneer Theatre Company's production of "The 25th Annual Putnam County Spelling Bee" on location at West High School. Seated, L-R: Jacob Hoffman (Chip Tolentino) and Elise Groves (Logainne Schwartzandgrubenierre) Standing, L-R: Shannon Tyo (Marcy Park), Emily Walton (Olive Ostrovosky), Kendal Sparks (William Barfèe) and Austin Archer (Leaf Coneybear). Few things in life are as intense as adolescent angst, when even minor matters assume life-and-death importance. Teenagers&apos; emotions  and often their bodies  are doing things they can&apos;t comprehend, and they are frantically trying to define individual identities while living up to adult expectations. As Rona Lisa Peretti (Mary Fanning Driggs), the moderator in "The 25th Annual Putnam County Spelling Bee," says, "It&apos;s a hard age for boys … and girls." Pioneer Theatre Company just opened a freewheeling production of the Tony Award–winning musical, which takes a lighthearted look at the challenges teens face within the framework of an American competitive classic  the spelling bee. Six spellers have made it to a rural spelling-bee final. Chip Tolentino (Jacob Hoffman), last year&apos;s winner, confidently expects to repeat until he&apos;s betrayed by a crucial part of his anatomy. "My puberty&apos;s ruined my spelling," he explains with embarrassment. Logainne Schwartzandgrubenierre (Elise Groves) lisps, writes the words first on her arm, and has two gay fathers whose lifestyle she feels compelled to validate. She wants to lower the voting age to 10, Rona tells us. Leaf Coneybear (Austin Archer) is at the bee only because the winner at his school is attending his bar mitzvah. "I&apos;m not that smart," he sings, but he spells each word as if possessed and gains assurance as he goes along. The multitalented, multilingual Marcy Park (Shannon Tyo) is convinced she can win easily, but she&apos;s not sure she wants to. She is tired of being the best and brightest and living up to everyone&apos;s expectations, including Jesus&apos;. William Barfée (Kendal Sparks) is the quintessential nerd. He exudes cocky self-confidence, has no social skills, uses his "magic foot" to spell, and everyone mispronounces his name. Finally, Olive Ostrovsky (Emily Walton) is a New Age child who has to depend upon herself. Her mother is at an ashram, and her father is never around when needed. The dictionary is her best friend because words are dependable. In one of the show&apos;s most poignant moments, she and her parents sing of their love, but it doesn&apos;t seem any more real than "chimerical," the word she must spell. Rona once won the bee by spelling "syzygy" and loves the moments when the unexpected happens. Her helper, Vice Principal Douglas Panch (Jeff Talbott), revels in creating outrageous sentences to illustrate the words  for example: "Billy, put down that phylactery; we&apos;re Episcopalians." Comfort counselor Mitch Mahoney (Erick Pinnick) is on probation, and distributing juice at the bee is part of his community service; he has a big voice and James Brown presence. Four spellers selected at each performance from the audience add to the confusion. First they get words like "cow" and "Mexican," then harder ones to eliminate them from the competition. One person cleverly substituted "s-t-u-m-p-e-d" for his final spelling attempt on opening night. Driggs and Talbott have to invent facts about them and sample sentences on the fly, which they have great fun doing. The performances are uniformly excellent, and the show&apos;s spirit of spontaneous anarchy compensates for its lack of depth, while Karen Azenberg directs with delicious abandon. Daniel Pelzig contributes some quirky choreography, and musical director Helen Gregory keeps everyone tunefully together. From Leaf&apos;s cape to Olive&apos;s tie-dyed dress, Gregory Gale&apos;s costumes are totally keyed to character. Rapid-fire repartee and engaging performances add body and flavor to "The 25th Annual Putnam County Spelling Bee." When • Reviewed on Sept. 12; plays Mondays through Thursdays at 7:30 p.m. and Fridays and Saturdays at 8 p.m. through Sept. 27, with Saturday matinees at 2 p.m.
Tickets • $38 to $59 in advance; $5 more on the day of the show. Half price for students K–12 on Mondays and Tuesdays. Call 581-6961 or visit http://www.pioneertheatre.org for tickets and information. Note • Performances on Thursday, Sept. 18, and Wednesday, Sept. 24, include the original lyrics to "My Unfortunate Erection (Chip&apos;s Lament)." The altered version of the song offered by the show&apos;s writers, "My Unfortunate Distraction," is sung at all the other performances.